MED-EL has received FDA clearance for the BONEBRIDGE as a Class II active implantable bone conduction hearing system. What is the BONEBRIDGE Hearing Implant? BONEBRIDGE is an innovative hearing system in which a bone conduction implant, the BONEBRIDGE, is implanted under intact scalp skin behind the ear. 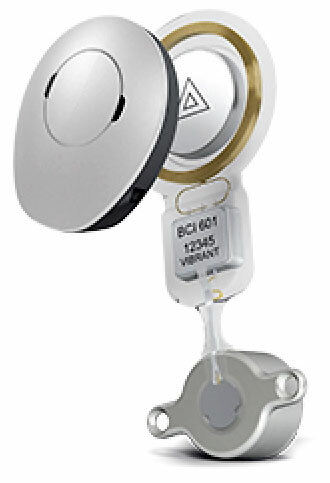 The implant is stimulated through intact skin (transcutaneous) rather than having an implant that penetrates through the skin (percutaneous) such as with other osseointegrated bone conduction systems such as the BAHA Connect or Ponto implants. BONEBRIDGE implant (coil plus floating mass transducer on right) beneath intact skin behind the ear with Samba external sound processor (gray processor on the left). How Does the BONEBRIDGE Work? 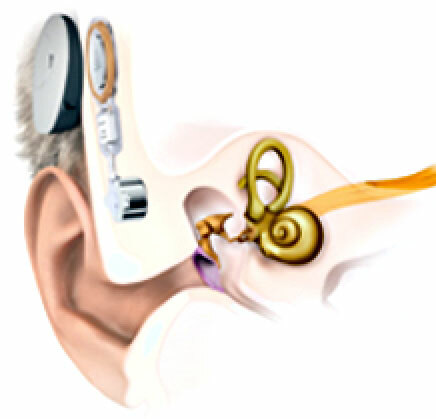 For conductive hearing loss, the cranial bones are stimulated by mechanical vibrations, generated by a floating mass transducer, that are transmitted directly to the inner ear and processed as natural sound. For single-sided sensorineural hearing loss, where the opposite ear has normal hearing, bone conduction sound is transmitted from the deaf ear side, through the skull, to the opposite normal hearing ear. In this situation, the patient hears from their "bad" side in their opposite, "good" ear. Is the BONEBRIDGE Implant Visible? No, the BONEBRIDGE implant is not visible. It is completely implanted. No portion of the implant protrudes through the skin. BONEBRIDGE does have an externally worn, battery powered, sound processor, the Samba. Samba is visible but has a very thin profile and is easily hidden from view by hair. BONEBRIDGE provides optimal daily hearing performance while remaining discreet and unobtrusive. The implant is invisible because it is implanted under intact scalp skin. It is more hygienic and cosmetically appealing than most previous bone conduction implants and decreases the chances of skin irritation and complications. BONEBRIDGE is an appropriate solution for candidates twelve years and older who have conductive or mixed hearing loss and can undergo a general anesthesia. It is also an option for individuals with single-sided deafness. (2) The externally worn, battery powered, SAMBA audio processor. Interchangeable design covers to "blend in" with hair or "stand out"! Patients 12 years or older who can undergo general anesthesia. Patients who have a conductive or mixed hearing loss and can still benefit from sound amplification (good word recognition ability). The pure tone average (PTA) bone conduction (BC) threshold (measured at 500, 1000, 2000, & 3000Hz) should be better or equal to 45dBHL. Bilateral implantation for patients who have symmetrical conductive or mixed hearing loss with differences between ears less than 10dB (BC) thresholds on average measured at 500, 1000, 2000, & 3000Hz and less than 15dB at individual frequencies. The BONEBRIDGE hearing implant design utilizes transcutaneous bone conduction stimulation rather than percutaneous stimulation. It offers an alternative to other osseointegrated hearing implants as the implanted components are completely beneath scalp skin with no implanted components penetrating or protruding from the skin. Preoperative CT scanning of the temporal bones (skull bone containing the ear) is required for surgical planning. Implantation of the BONEBRIDGE requires a surgical procedure that is performed under general anesthesia, typically in an ambulatory surgery center, as an outpatient. Patients require surgical clearance and must be able to undergo general anesthesia. Prior canal wall up or canal wall down mastoidectomy is not necessarily a contraindication as the implant can be placed in several locations behind the ear. Surgical sutures are removed 7-10 days postoperatively, depending on healing. Time to sound processor stimulation postoperatively depends on individual healing and will be determined by your surgeon. Conditional MRI scanning may be possible with low Tesla MRI scanners and head wrapping. The need for frequent MRI scanning may be a contraindication for having a BONEBRIDGE implant. Patients with allergies to BONEBRIDGE components should not receive a BONEBRIDGE implant. If you would like to learn more about the MedEL BONEBRIDGE hearing system, please contact our office at 336-273-9932 during regular business hours.